James Platts was born at Bagthorpe, Nottinghamshire in 1890. His parents were James, a coal miner hewer born Ilkeston, and his wife Kate (nee Wright). The 1911 Census shows James and Kate had 11 children of whom 4 had died by that time. James’ occupation was given as a miner. His parents later moved to Great Northern Road (Pye Hill Road) where they had a grocer’s shop. James enlisted in Nottingham and after training was sent to France in August 1915 where, just over two years later, he was fatally wounded. He is buried at Lijssenthoek, a village situated on the main communications line between the Allied Military Bases and the battlefields of Ypres. Close to the front, but out of the extreme range of German artillery, Lijssenthoek was a natural place to establish a Casualty Clearing Station. Private Platts was probably brought to this field hospital, later dying of his wounds on Thursday 20th September 1917, aged 27/28 years. Buried at Lijssenthoek Military Cemetery, Poperinge, Belgium; this is the second largest Commonwealth War Graves Cemetery in Belgium. James was awarded the 1914-15 Star, the British War and Victory Medals. In April 1918 personal effects of £4 6s 1d were sent to his father, followed by a war gratuity of £3 10s in 1920. James is remembered on his parents’ grave at St. Mary’s, Westwood. 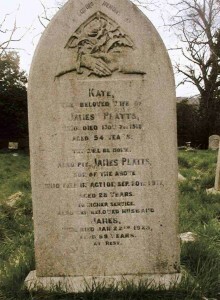 His father (James Platts) died on the 2nd Jan 1923, aged 59 years. 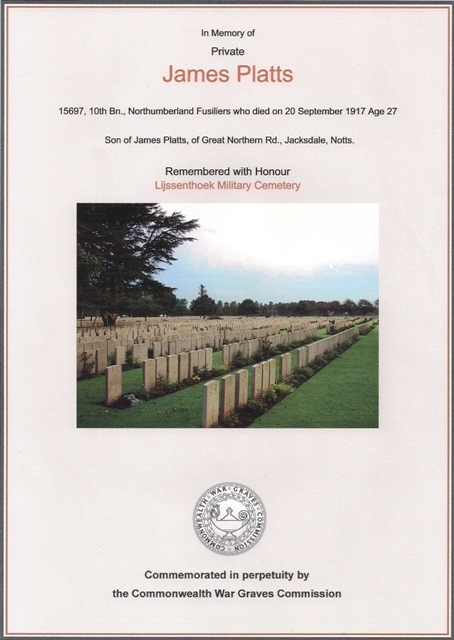 His mother (Kate Platts) died on the 7th November 1918, aged 54 years. His parents’ grave pays homage to their son, Private James Platts, who ‘fell in action’ but states that James was 28 years old at time of death, unlike the Commonwealth War Graves Commission which indicates (presumably from Army records) that he was 27.